Some unfortunate people in this world still don’t have running water, fresh fruit or access to the internet. 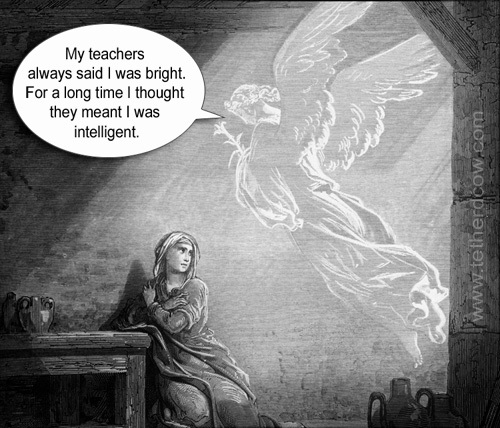 These poor souls are completely unable to enjoy the pleasures of the Annunciation Funnies. Bring some joy into those folks’ lives today by purchasing an Annunciation-themed coffee mug from the Tetherd Cow Ahead Shoppe. Remember: all profits raised go to keeping the Reverend in single malt whisky! Nah… you’ll have to do better than that. That’s just an inferior version of my Modern Annunciation. I am telling you I saw a ghost! 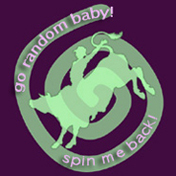 Creepy new sidebar photo by the way, Revrend. Creepy? Whaddya mean? Are you in league with that ShooTag mob or something? Oh, COME ON, Rev! Writin TH LINE, ocourse, is easy! Workin it inta a SCRIPT, is quite anothr! You have to admit – the Holy Ghost manages to have quite a lecherous demeanour for a Lego piece. 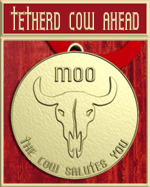 Tetherd Cow Ahead is powered by	WordPress 4.2.23 and delivered to you in 0.750 seconds using 97 queries.